"Sai Kung" redirects here. For other uses, see Sai Kung (disambiguation). Sai Kung Town (Chinese: 西貢市) or simply Sai Kung (Chinese: 西貢) is a town on Sai Kung Peninsula, facing Sai Kung Hoi (Inner Port Shelter), part of Sai Kung District in the New Territories, Hong Kong. Sai Kung is the centre of the surrounding villages, and hence the name may refer to the areas in its immediate surroundings. The name “Sai Kung” dated back to the early days of the Ming Dynasty. The Ming court had sent officer Zheng He and his fleets to sail to the Western oceans seven times during 1405-1433. After these voyages, many boats from countries in East Asia, Middle East, and East Africa started paying tribute to and developing trade with the Ming court. At the time, Sai Kung was the port of the boats from the West. As time passed, it was called “Sai Kung” which means “tributes from the West” in Chinese. Sai Kung Hoi was a fishing harbour and fishermen still gather there. The harbour is now a typhoon shelter, where motorized junks used in the local tourist trade are moored. They are boats that can be hired for fishing and swimming trips. Sai Kung town underwent significant expansion during the 1970s when the High Island Reservoir and associated water schemes required some villagers and fishermen to be rehoused in Sai Kung. This provided a core of government-funded new development, both housing and commercial, in the town centre. This was followed by the Tui Min Hoi (literally 'over the harbour') development under the government's market town programme. Before the relocation of the airport of Hong Kong from Kai Tak to Chek Lap Kok, the town was a popular residential area for airport staff from all over the world. Tui Min Hoi Chuen (Chinese: 對面海邨) is a public housing estate in Tui Min Hoi, developed by Hong Kong Housing Society. It is the first rural public housing estate developed by Hong Kong Housing Society. It consists of 4 blocks of 5-storey buildings completed in 1984, 1985 and 1986 respectively. Lakeside Garden (Chinese: 翠塘花園) is a public housing estate and Flat-for-Sale Scheme estate on the reclaimed land. It is the third rural public housing estate developed by Hong Kong Housing Society. It consists of 11 residential blocks completed in 1997. Except one block for rental use, other 10 blocks are for sale. Sai Kung is primarily served by double-decker buses, public light buses and green taxis. There is no MTR link to Sai Kung. Ferry services are available to the neighbouring islands and isolated coastal villages in the Sai Kung Hoi, as well as to the public golf course on one of the nearby islands. Sai Kung is served by Sai Kung & Clearwater Bay Magazine, a free-distribution English language monthly magazine and the community website Saikung.com. Hong Kong Academy is in Sai Kung. Sai Kung Sung Tsun Catholic school is also in Sai Kung. ^ "Monthly Means of Meteorological Elements for Sai Kung, 1994-2017". Hong Kong Observatory. 21 February 2018. Retrieved 29 December 2018. ^ "Monthly Means of Meteorological Statistics for Sai Kung, 1994-2017". Hong Kong Observatory. 29 January 2018. Retrieved 29 December 2018. ^ "Extract of Annual Data - Sai Kung". Hong Kong Observatory. 29 January 2018. Retrieved 17 May 2017. 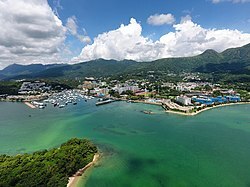 Wikimedia Commons has media related to Sai Kung Town.